World of Interiors – April 2015 – The Mid-Century Modern v11 Vase by Rye Pottery. Please click the image above to find out more. 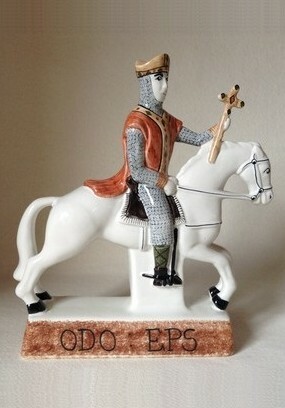 New for 2015 is Bishop Odo – the latest addition to our 1066 Battle of Hastings Bayeux inspired range. William the Conqueror’s Half brother and the former, some say tyrannical, Earl of Kent, Bishop Odo was also Bishop of Bayeux. He’s a key figure in the 1066 story. In production terms Odo is one of the most complex and intricate pieces we’ve ever made, with almost 20 hand-made stages involved to bring him to life. Odo is also the first figure in this range commissioned by siblings Josh & Tabby Cole – the third generation of the Cole family to run the company. Do click the photograph to see him in more detail.